The EB-01 EN YA Acoustic guitar combines a mahogany top and mahogany back and sides to produce a beautiful rich and full tone from such a small instrument. The natural matte finish allows the guitar to vibrate and produce very nice clear tones. 21 frets with a rosewood fingerboard includes maple star inlays and the EN YA logo at the 12th fret. The bridge is rosewood and includes a compensated bridge saddle. The EB-02 EN YA Acoustic guitar combines a AAA Engelmann solid spruce top with a natural matte finish. Sapele back and sides are also a natural matte to allow the guitar to vibrate and produce very nice clear tones. 21 frets with a rosewood fingerboard includes maple star inlays and the EN YA logo at the 12th fret. The bridge is rosewood and includes a compensated bridge saddle. Gig bag is included. 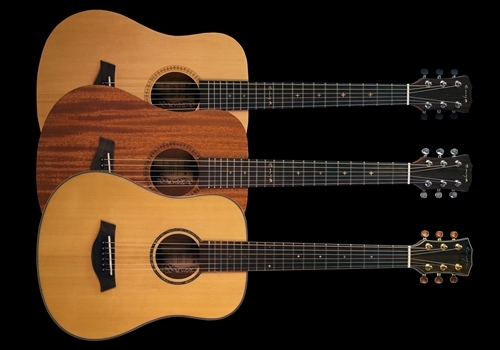 The EB-03 Acoustic guitar combines a AAA Engelmann solid spruce top with a glossy finish. Rosewood back and sides wiith a glossy finish. 21 frets with a rosewood fingerboard includes pearl dot inlays and and a pearl inlaid rosette around the soundhole. The bridge is rosewood and includes a compensated bridge saddle. Gig Bag is included.